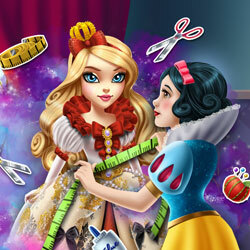 Description: Snow White enjoys sewing beautiful gowns for Pure Princess, but today she found her studio a complete mess. Look for the missing items to clean up the room, and once you're done, start the design. Prepare the fabric, glue the accessories, comb her hair and the princess will be ready for the big ball.